The A1 is great value for money, delivering an uncluttered Android in a phone that punches way above its price tag. We’re fascinated by Xiaomi, which has quickly carved out a niche as the Apple of Android: it takes a similarly stripped-back approach to Cupertino’s finest, offering phones that don’t faff around. The Mi A1 is a great example of that. It’s a revamped Mi 5X and looks and feels fantastic. There are a couple of wrong notes – no NFC means no mobile payments, and the screen is disappointing – but it’s still an awful lot of phone for not a lot of money. Some phones feel unbalanced or slippy; not the A1. The only wrong note is in the top and bottom bezels, which are unfashionably large. There’s a very loud speaker, a speedy fingerprint scanner (on the back, where it makes most sense), USB-C and a 3.5mm headphone jack. There’s also an IR blaster so you can use the A1 as a remote control for your home entertainment kit. The big selling point here is the dual lens 12MP camera, which has been borrowed from the Mi 6 flagship. It’s not identical – the main lens is slightly poorer in low light, and doesn’t cope as well as rivals such as the Moto G5S – but in ordinary conditions it takes superb photos, especially portraits: we think it does a better job than the twin-lens OnePlus 5 series. It’s one of the best cameras we’ve seen in a budget device, for photos at least: while it can do 4K video, the lack of stabilisation often means it’s shakycam 4K. The front camera’s an adequate 5MP. The 5.5 inch IPS LCD offers 1080 x 1920 and is nice and bright, but colours feel lacklustre – not just compared to an iPhone’s IPS LCD, but to the LCDs in rival budget devices. Movies in particular aren’t as good on this display as on similarly priced rivals. Audio is much better, with above average performance both through the mono speaker and through headphones. 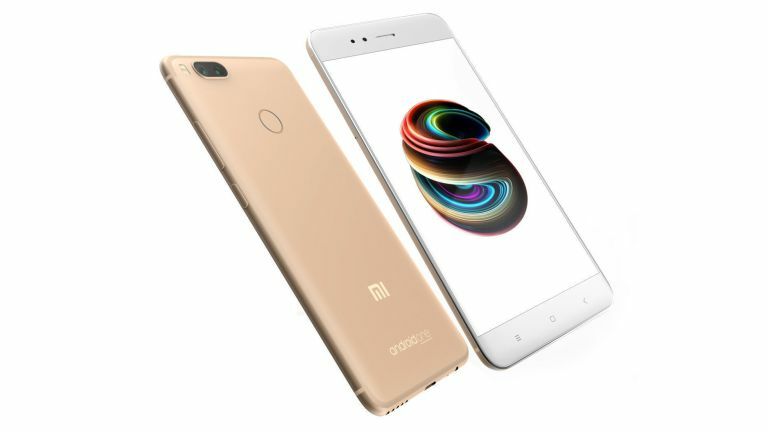 The phone is Android One certified, which means Google provides the OS and firmware updates and Xiaomi hasn’t messed around with the OS. It’s running Nougat but an Oreo upgrade is promised. Insider there’s an octa-core Snapdragon 625 and 4GB of RAM with 64GB of storage. In everyday use it actually outperforms rivals such as the Redmi Note 4 thanks to the lack of Android tinkering, which means there’s fewer processes going on in the background. App launching and switching is noticeably faster and multitasking is effortless. The phone didn’t get hot or weird even with 25 apps running simultaneously. We’d compare it to more powerful rivals such as the OnePlus 5T: the Android One optimisation makes that much difference. The battery is 3,080mAh and doesn’t offer fast or wireless charging, even though it has a USB C port and a suitable Qualcomm chipset. So it’s just as well that the battery copes admirably with even the most demanding days. We averaged 15 to 18 hours in everyday usage. The combination of Android One optimisation and good quality hardware means the Mi A1 punches way above its weight: it’s comparable to phones costing twice as much. The main disadvantage isn’t the phone, but the phone company: Xiaomi’s presence in the West isn’t massive, so tech support and repairs could prove problematic. When you consider the price is just £200/AU$300/US$250, though, that’s a risk many buyers will be happy to take.